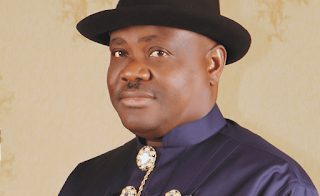 The National Industrial Court in Yenagoa, Bayelsa State, has restrained Governor Nyesom Wike of Rivers State, the state House of Assembly and their agents from dissolving or, in any manner whatsoever, interfere with the tenure of office of the 23 local government council chairmen in Rivers State. A Federal High Court in Port Harcourt, yesterday, adjourned till July 9, for hearing in another suit by the 22 council chairmen against the Rivers State Government. The case is before Justice B. Quadri. As early as 7a.m., supporters of the Peoples Democratic Party, PDP and All Progressives Congress, APC, had taken over the premises of the Federal High Court on Station Road, Port Harcourt. To prevent breakdown of law and order, policemen had to close one of the lanes to traffic. “The governor of Rivers State, the Rivers State House of Assembly and the Attorney-General of Rivers State and their agents are hereby restrained from dissolving, suspending, sacking terminating or in any manner, whatsoever, interfering with the tenure of office of the 23 council chairmen of Rivers State, pending the hearing and determination of the motion on notice for interlocutory injunction. At the Federal High Court, Port-Harcourt , Attorney General of the state and counsel to Rivers State Government, Emma Aguma, accused the council chairmen of abuse of court process for filing the same process before the National Industrial Court in Bayelsa State. On his part counsel to the plaintiffs, Mr Abiodun Owonikoko, SAN, said his clients did not abuse court process as alleged by the state Attorney General.